Belief in the likelihood of success: Students’ belief in their own self-efficacy is a better predictor of academic success than measured ability. Students need to feel that they’re likely to succeed in order to sustain the hard work of learning something challenging. When students believe they’ll fail, they often don’t invest in the work or devalue the task. The work has meaning and value: The brain naturally looks for connections. When students find academic work to be relevant to lives, interests, and concerns they’re much more likely to work on a task in a sustained way and to perform well. It takes much more energy to focus attention on a task that does not have direct value to the student. 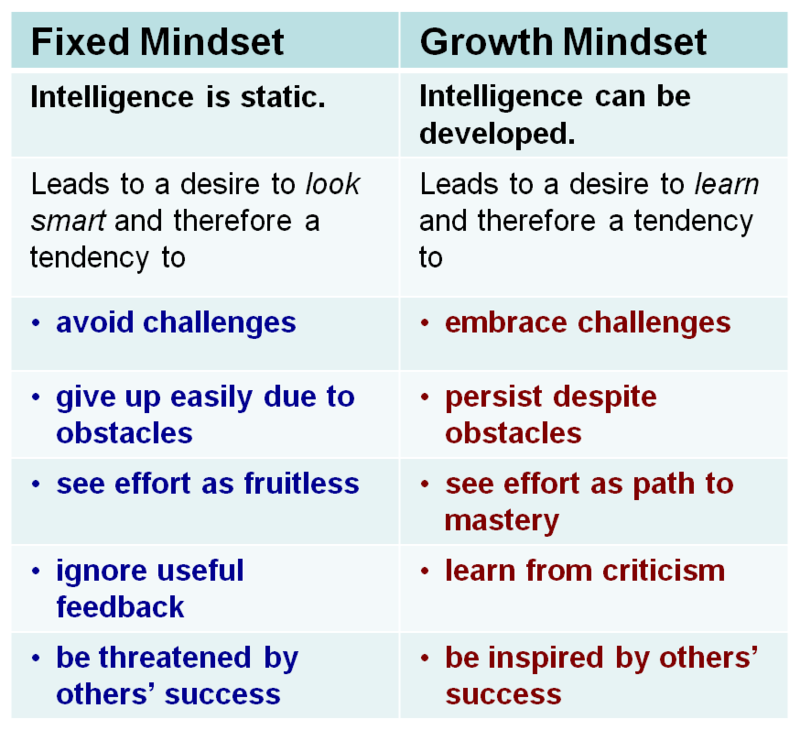 Belief that abilities and intelligence can grow with effort: Known as a growth mindset, Carol Dweck’s theory we refer to above) if students believe the brain is a muscle that must be exercised, they’re more likely to interpret setbacks as opportunities to learn and improve. This mindset is associated with the joy of mastering a task, rather than learning for a grade or to outperform others. “Students always have mindsets and they’re always in the process of affirming the mindsets they already have,” Farrington said. “If they believe that they don’t belong or they can’t really do it then they’ll be looking for confirmation that that’s true.” It’s the teacher’s job to interrupt that negative mindset and turn it around to something positive and adaptive. Researchers have seen the impact of small, experimental interventions on a limited scale, so teachers who see kids every day can have a much bigger effect. Influencing how students view themselves as learners is challenging work. Students often won’t respond if a teacher just tells them how they should think — that creates defensiveness. Instead, a good tactic is to teach them some of the neuroscience around learning, including that the brain is malleable. “You’re telling students that when you work on really challenging things that’s when your brain is growing the most,” said Carissa Romero, assistant director of Stanford’s PERTS center, which studies academic motivation. Giving them a reason to care about their approach to learning helps them connect it to their own lives.